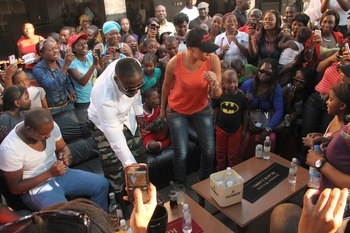 Former Big Brother Africa-The Chase housemates Pokello (right) and Elikem (centre) dance to music with some of their fans at a fun day held at Kebab Centre in Harare yesterday. He said Pokello is a “dadaba’’ (Ghana word) for spoiled child. Elikem, who could be heard saying (Ndeipi) Shona slang for how are you? was clad in camouflage shorts with matching shoes and cap during the Summer Jamboree held at the Kebab Restaurant in Newlands, Harare. Pokello and Elikem had a photo-shoot and autograph signing at the restaurant yesterday. The duo also stole the show when they danced to popular Azonto song from Nigeria, which drove their fans wild. They are set to tour the Heroes Acre today before they leave for Ghana tomorrow.